I always look forward to Cinco De Mayo and an excuse to either go out for some yummy Mexican food or even better, cook some at home. Tacos have always been a go to meal at our house, but lately I have discovered how easy enchiladas are to prepare at home and love them in all their varieties. Today, I have put together a Cinco de Mayo menu, starting with a delicious low calorie and low carb margarita and ending with a fun margarita cake. All these recipes are easy to prepare and will help you create a festive Cinco de Mayo celebration right at home. 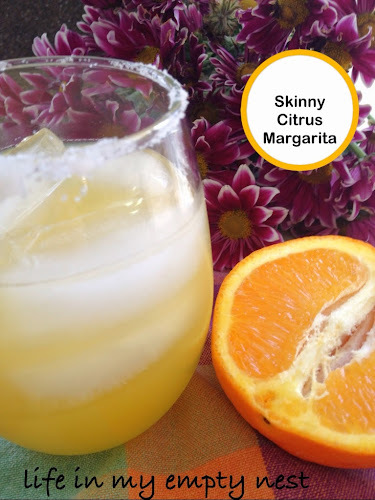 To start the celebration, these Skinny Citrus Margaritas are really the best. 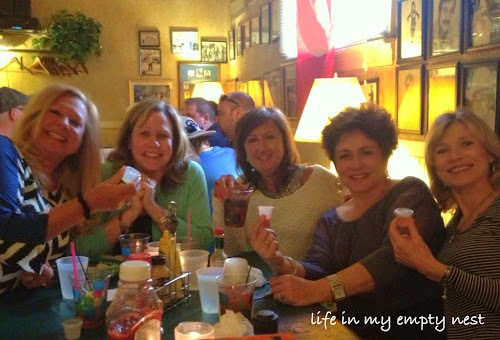 I love a good margarita, but usually they are filled with carbs and sugar from the margarita mix. These are light, refreshing and a perfect start to your Cinco De Mayo party. 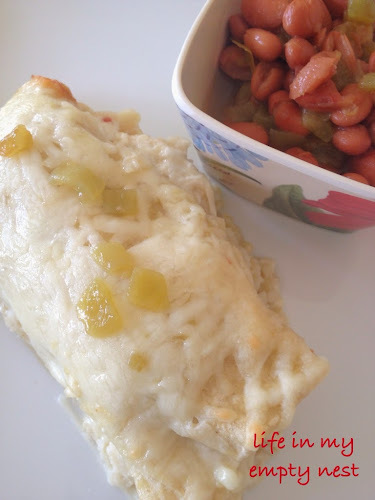 Easy Chicken Enchiladas are made with green enchilada sauce and a generous amount of monterrey jack cheese and are a fun twist on the more traditional beef enchilada made with red sauce. Serve with some pinto beans with green chilies added and you have a delicious and festive main course. 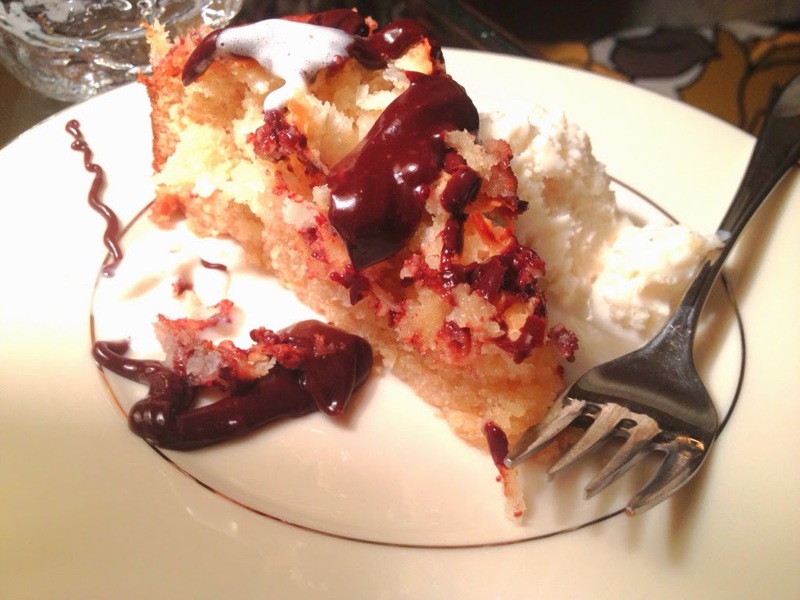 Finally, this Skinnygirl Margarita Cake is so fun and the perfect ending to this holiday menu. 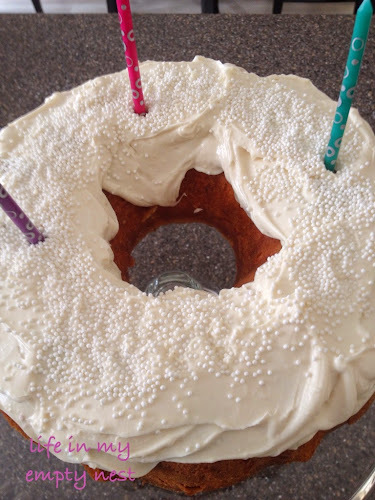 The secret to its yummy flavor is the frosting - canned frosting with Skinnygirl Margarita mixed in, for extra flavor. Have fun planning your own Cinco De Mayo menu at home. Looking through recipes, I wasn't really finding what I was looking for, so I decided to combine a few recipes and make my own version. One recipe I looked at even suggested using leftover whole wheat hamburger buns for the french toast, which I thought was a great use of those stale buns we inevitably have after a cookout. I also easily made this recipe sugar free, by using Splenda and sugar free maple syrup. 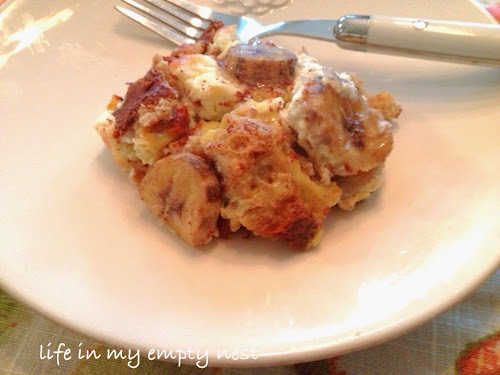 This was a delicious way to prepare that french toast I crave, even on the busiest of mornings. The bananas help add to the sweetness and the cream cheese (low fat) is a delightful and unexpected twist. Please note - this recipe should be left overnight, but in a pinch you can refrigerate it for 2 hours before baking and it will be just fine. In an 8 x 8 baking dish, coated with cooking spray, place bread cubes. Tuck cream cheese, cut into small pieces, throughout the bread cubes. Place sliced bananas on top. Whisk together, eggs, milk, Splenda, maple syrup and cinnamon. Pour mixture over top of bread cubes and cover baking dish. Place in fridge overnight. Bake covered for 30 minutes at 350 degrees. Uncover and bake an additional 25 to 30 minutes. Let sit 10 minutes before serving with additional sugar free maple syrup. Enjoy! We had a fantastic day on Saturday. Since Melissa will be a senior at MSU next year, I am starting to feel the clock ticking regarding the days of having a child attending college. 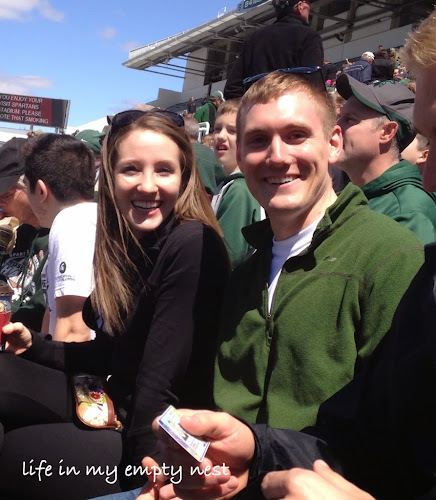 I am determined to attend every event at her college that we can and on Saturday, we attended the Spring Green and White Football game with the whole family. Melissa met us there, along with Megan and her boyfriend. It was a beautiful, sunny spring day; sunglasses and sweatshirt weather. 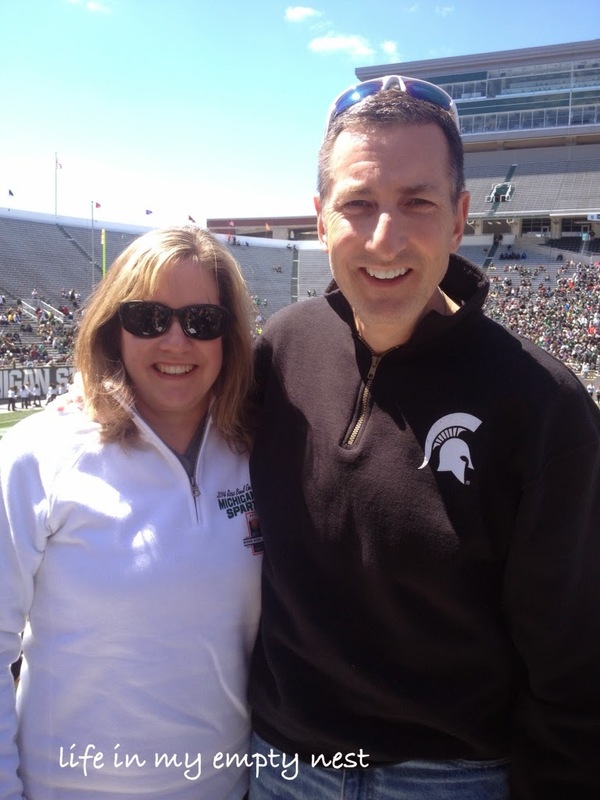 We sat in the stands, soaking up the sunshine, and enjoyed spending the time together at one of our favorite places - Spartan Stadium. There was a great turnout for the game and the atmosphere was lively and celebratory, with the seniors being honored at halftime for the Rose Bowl victory. 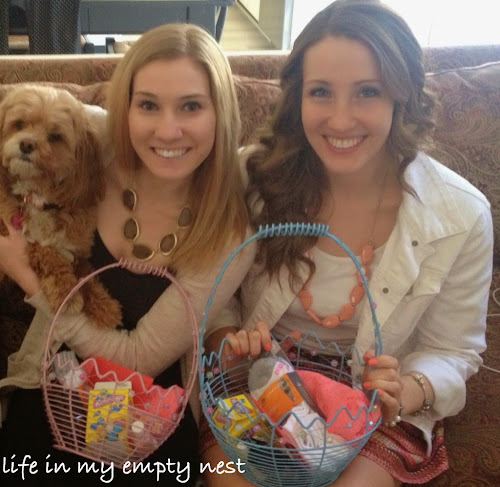 On Sunday, Megan and I attended a bridal shower that was just beautiful. 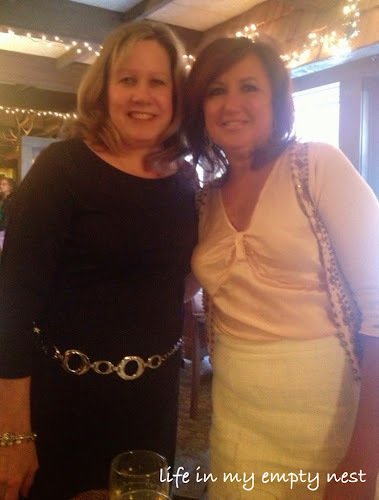 There was a lovely brunch style buffet, mimosas and a bride to be that we have known since she was a little girl. In fact, I was the brownie leader for this group of girls, when they were in first grade. Time really does fly! As we left the shower, our favor was this embellished bottle of wine and I thought that was such a fun idea. 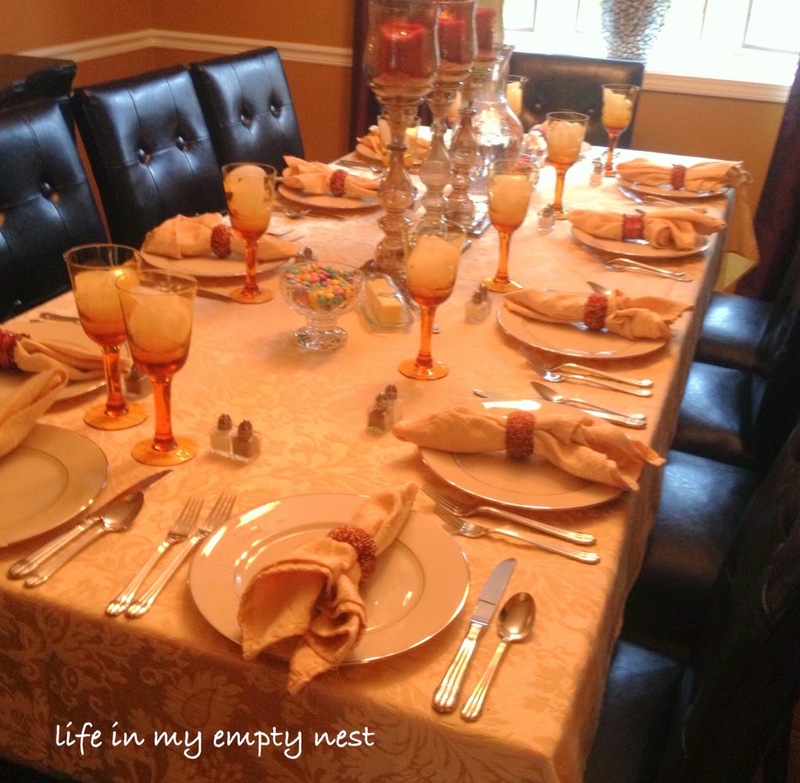 We arrived at book club to a beautifully set table in shades of gold; very warm and welcoming. We were all looking forward to discussing the book and as sometimes happens, small discussions began to break out over a book we were excited to talk about. But, those discussions were saved for later, because our hostess had a lovely dinner prepared for us to enjoy and we poured a glass of wine and gathered around the table together. 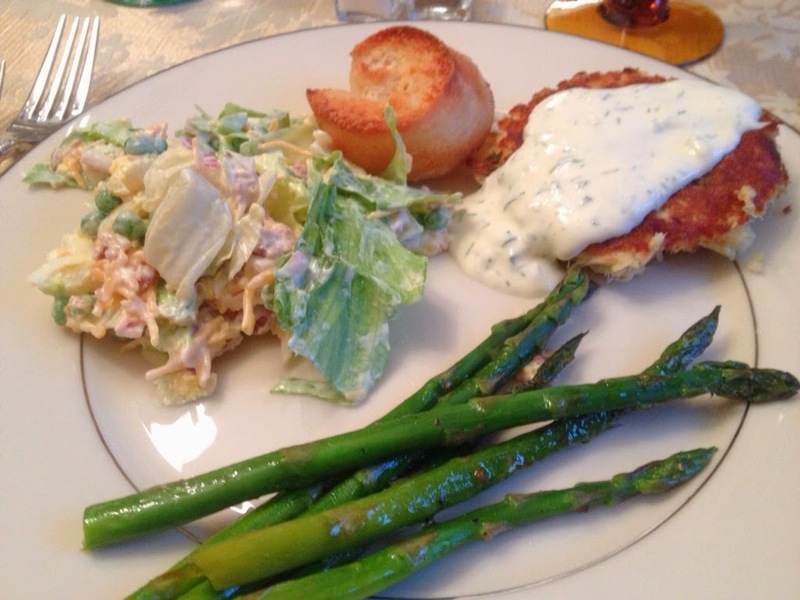 We enjoyed a beautiful springtime menu of crab cakes, a layered salad with peas and fresh asparagus. It was light and delicious and looked so pretty, when served. Sitting around the table together is something we enjoy so much and we have been treated to delicious meals over the years. And just look at this dessert - a coconut cake that was moist and full of flavor, served with a scoop of vanilla ice cream. We were definitely spoiled by our hostess! 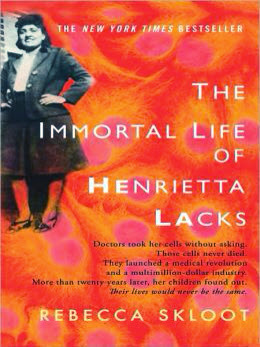 Our book in April was The Immortal Life of Henrietta Lacks and it lent itself to a very lively discussion. Henrietta Lacks was a poor, black women who died of cervical cancer in 1951. Her cancer cells were the first cells to reproduce in a laboratory and to this day are still being used for medical research. This is the story of her life, the medical history of the cells and how her uneducated family was unaware of her medical history and how her cells were being used. It was very interesting from a medical ethics point of view. My book recommendations have been few and far between lately, but I recently read a book that was very interesting and quite a good read. 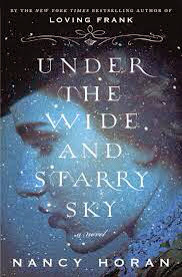 Under the Wide and Starry Sky, by Nancy Horan is the fictionalization of the life of Fanny Vandegrift Stevenson, the wife of writer, Robert Louis Stevenson. It is written as a fictional recreation of a true story, so while the facts are consistent with what occurred in their life together, many of the conversations are created for the story. I find this style most interesting and based on the many true diary excerpts highlighted in the book, the author did a wonderful recreation of their point of view. This book is more than anything, an adventure story. The reader travels to Paris, London, California and finally sails the south seas with the Stevenson family. It is the story of Fanny's strength and her passion in making Robert Louis Stevenson a prolific writer and to improve his poor health, even to the detriment of her own. I have read many books in this style and enjoyed getting to know the wives in the background of their more famous husband's lives. All strong women in their own right, but willing to sacrifice much for their husband's genius. It is an interesting dynamic to to read about and witness. 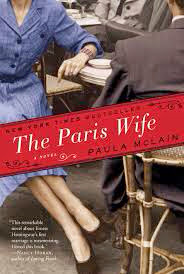 All these books in the same style are interesting reads and I especially loved The Paris Wife, the story of Hemingway's early days of writing and living in Paris with his first wife, Hadley Richardson. 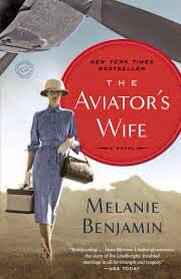 The Aviator's Wife is the story of Anne Morrow Lindburgh and tells the story of her life with Charles Lindburgh and the famous kidnapping that tore apart their life together. 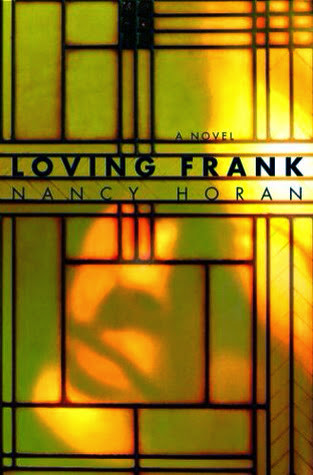 Finally, also by Nancy Horan, Loving Frank is the story of Kitty Wright and her struggle for respectability in the face of her husband's (Frank Lloyd Wright) known philandering. Her life was full of turmoil including a shocking event at the end of the book. 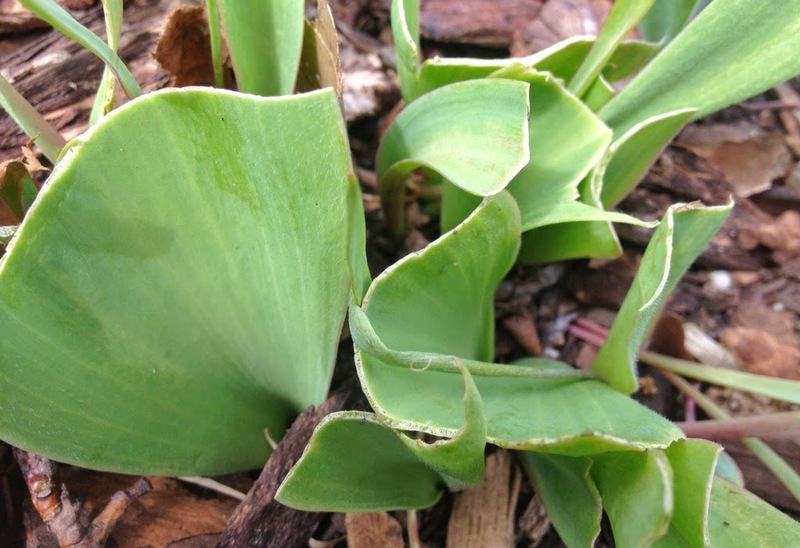 Way back in October, I planted some bulbs and scattered some flower seeds hoping, as all gardeners do, that in the spring, I would have blooms. After a long cold winter, with nothing green in sight, finally seeing green shoots and leaves and later actual flowers come through the ground, is truly a miracle. Every day or so, I wander through my yard and flower garden to see the progress and enjoy the process. 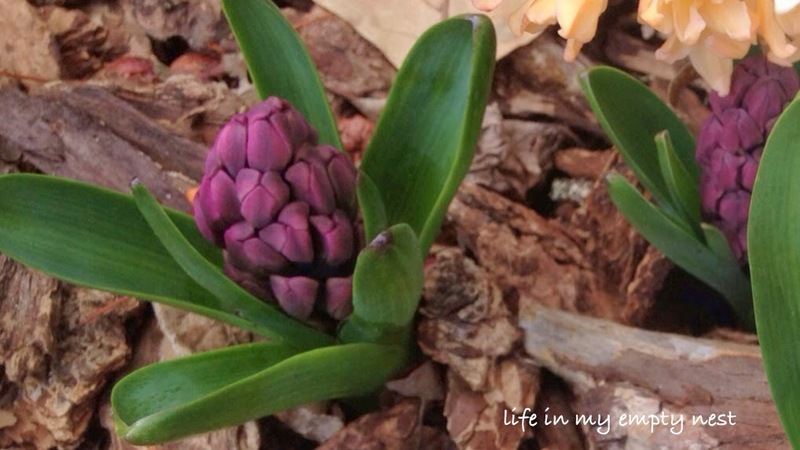 Aren't these hyacinth buds beautiful? I planted these in a grouping around some rocks and I love the vibrant colors. 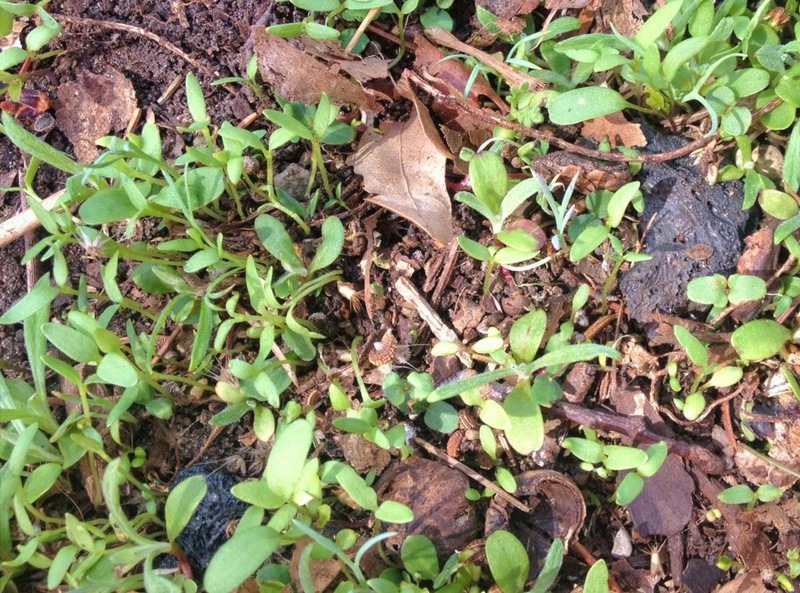 This lovely green sight, growing every day, is from the wildflower seeds I planted in the fall. To tell you the truth, even though I followed the company's directions to sow the seeds after the first frost, I didn't really believe anything would come up in the spring. I will be keeping an eye on these - they seem delicate, but are probably a lot hardier than I think, considering they are growing in quite a harsh spring. I am excited to see what flowers I will have to enjoy. And then there are my tulips. Thanks to a fat bunny that lives in my yard, though they came up beautifully and were close to blooming, I discovered they had become a lovely green snack. No tulip blooms at all this year and so disappointing! I did a little research and will try a few rabbit repellents next spring, including scattering coffee grounds around the first leaves that surface. 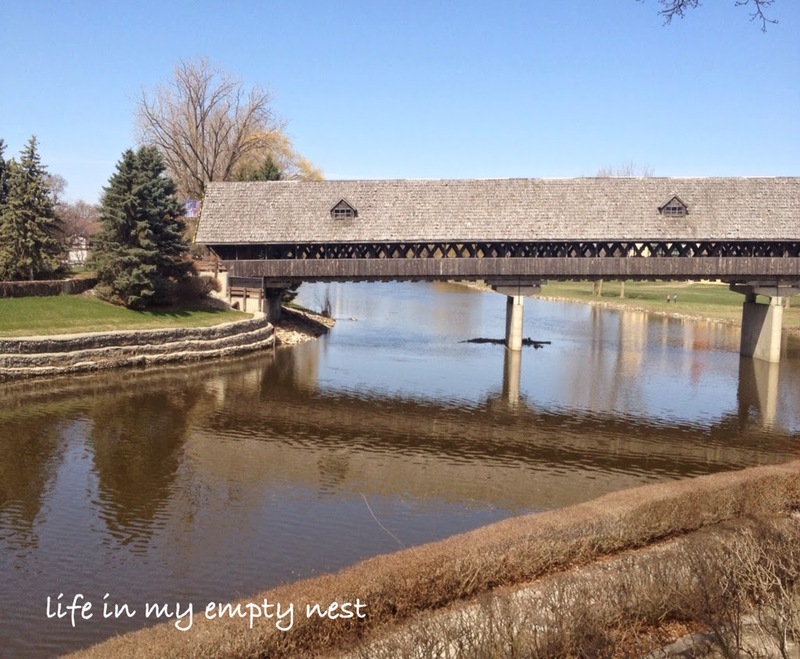 Our destination was a small city about an hour or so away, called Frankenmuth. It is a quaint place, steeped in German heritage, known for its old fashioned, all you can eat, chicken dinners. There is shopping, fudge shops and even a general store, complete with bags you can fill with penny candy. However, it is the dinner that is the highlight - chicken, mashed potatoes with gravy, homemade buttered noodles and more. All served family style at your table. It was lovely to wander through the shops and just enjoy being outside in the sunshine. Maybe not the most conventional Easter, or the most conventional Easter dinner, but we had so much fun spending our day together. 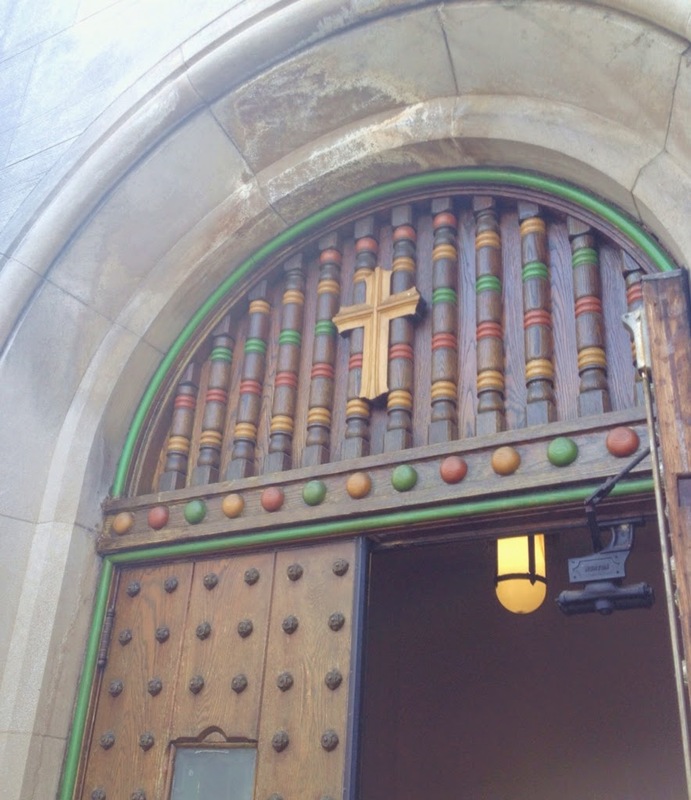 As is our annual tradition on Good Friday, we ventured into the city of Detroit for a fish fry, followed by the Good Friday vigil at a beautiful inner city parish. We had a lot of fun at an early lunch, which is traditional polish fare - fried perch or halibut, along with potato pancakes and pierogis. After lunch we headed to church, all together, as a group. There is something very special about attending mass with good friends that are so special to us. This church's Good Friday vigil is very moving, with lovely and spiritual music and is well attended. It is a quiet time to reflect and show your faith, during those hours Jesus spent on the cross. 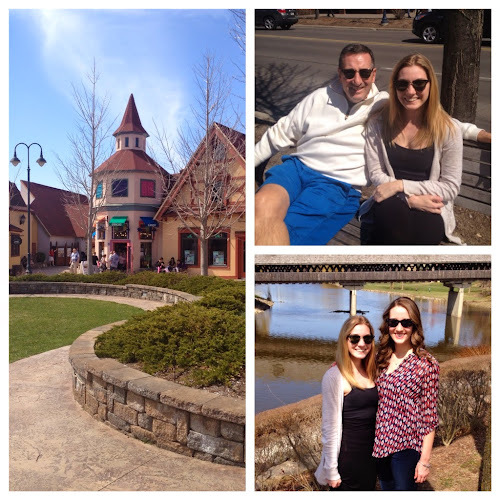 After mass, we made a few more stops at some of our favorite spots around the city. It was a lovely day filled with food, friends and most important, a celebration of our faith. My 40 bags in 40 days Lenten challenge in now complete for another year. Last year I was able to fill 40 bags, which means a lot of clutter and miscellaneous items were removed from my home. When I started the challenge this year, I wasn't sure if I would be able to find 40 bags from the areas I had in mind. 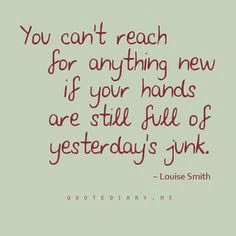 But, the process remains the same, no matter how many bags you fill. You are making space both in your home and in your mind. You are freeing yourself of the past and moving towards a future, that is calmer and a home only filled with what you really need. During lent, you are using the 40 days to take something on, instead of giving something up. And in writing about it here, I am showing my faith to the world. I was able to fill 27 bags this year. My total bags included 12 to donate, 14 to the trash and 1 bag of books for the library. I donated servings pieces, I never used, but were taking up space in a basement storage area. 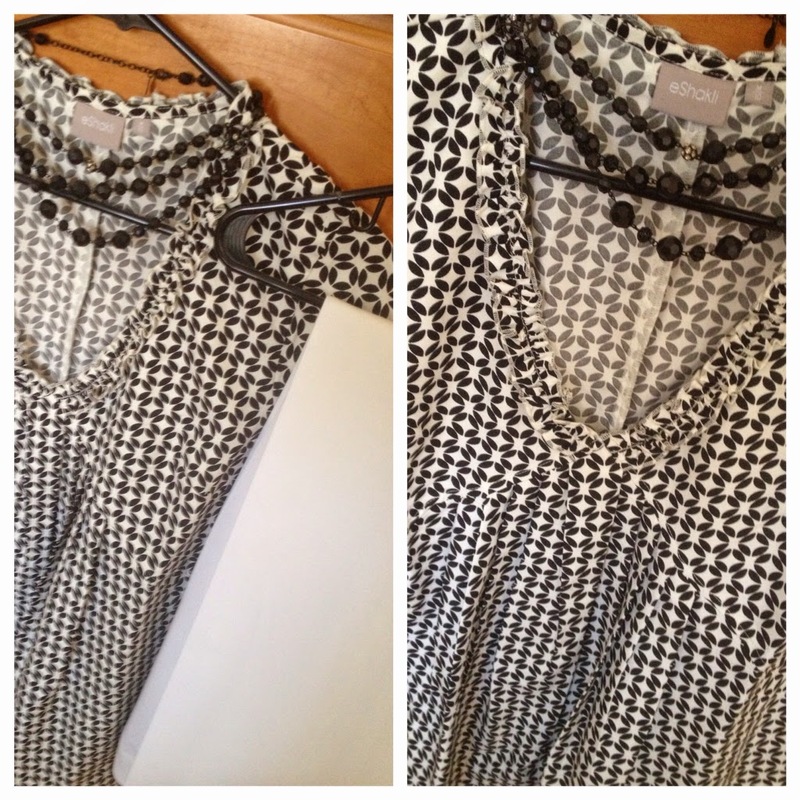 Many clothes, from every member of the family, will now be used by those who need them. Both a hall closet and my laundry room closet and cabinets were emptied and I feel uplifted when I see the space and the organization. This Lenten challenge has been good for me in many ways. It is something I will continue to do, whether I am able to fill 40 bags or not. It is the process that is good for your soul. This recipe is simple enough for everyday dinner, but pretty enough to be the perfect side dish when entertaining. 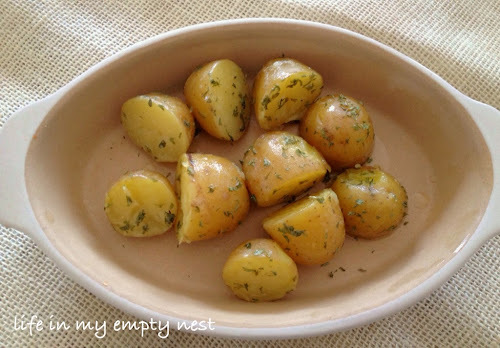 These potatoes are fluffy, buttery and so pretty with the green parsley. Fresh chopped parsley from your own herb garden is delicious, but even dried parsley from your pantry works fine too. Small redskin potatoes are also another pretty and delicious option. Scrub potatoes with vegetable brush and cut in half. Place in a medium pot and cover with cold water. Salt water generously and bring to a boil. Boil until fork tender (about 15 minutes) then drain water and place potatoes back in pot. While hot, toss with butter and parsley. Add salt and pepper to taste. Enjoy! 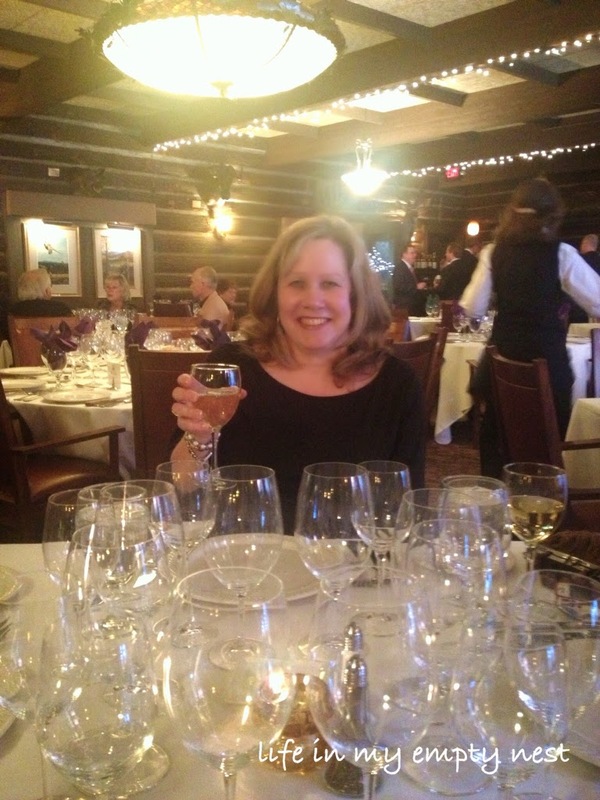 Our dinner, accompanied by lots of laughter and fun conversation, paired beautifully with the wines. The tasting courses included mussels with a touch of citrus, paired with Chardonnay; stuffed shells in a deliciously spicy sauce, paired with a Zinfandel; a peppery T Bone steak, cooked to perfection, paired with a Cabernet Sauvignon and an interesting and unique dessert - a pear slice, topped with crumbled pancetta, goat cheese and drizzled with honey, paired with a dessert wine. The Zinfandel was our favorite wine of the night and we came home with a few bottles to enjoy this summer, while having a candlelit dinner on our patio. Whether for Easter brunch, a bridal shower, Mother's Day or just because, on any Sunday, a mimosa is the perfect springtime cocktail. It is light, refreshing and when you add a garnish, like raspberries, it couldn't be prettier to serve. Of course, the traditional mimosa made with orange juice and champagne is lovely, but you can also give some variety to your guests by offering some unexpected flavors to choose from. From left to right in the photo, there are three types of mimosas shown; all simple to make and all delicious. 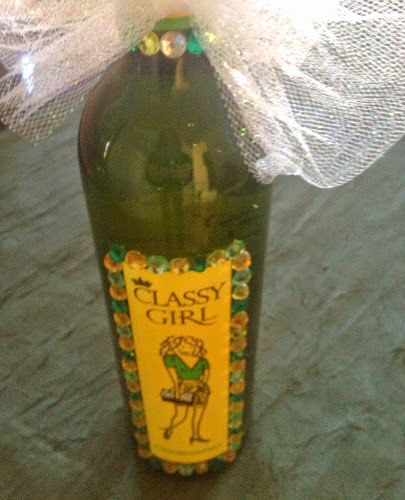 Pineapple Mimosa - fill a champagne glass with 1/2 champagne and 1/2 pineapple juice. Garnish with raspberries or a thin pineapple slice. Traditional Mimosa - fill a champagne glass with 1/2 champagne and 1/2 orange juice. Garnish with raspberries, pomegranate seeds or a thin orange slice. 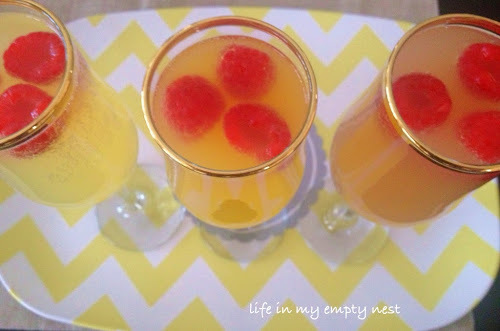 Sparkling Grapefruit Mimosa - fill a champagne glass with 1/2 champagne and 1/2 sparkling grapefruit juice. Garnish with raspberries or a sectioned grapefruit. Another way to serve mimosas, when entertaining, is to set up a pretty mimosa bar for your guests to serve themselves. Simply place the different juices in beautiful glass pitchers, fill interesting bowls with a variety of fruit for garnishing and place bottles of champagne and prosecco over ice. This weekend was an eye opener in my relationship with my aging parents. 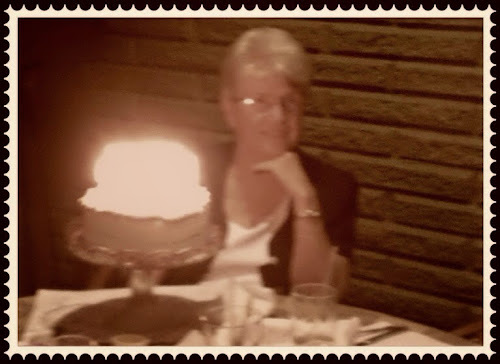 My parents are definately starting to show their age and it's hard to know how much help they need and how much to push when help is refused. Luckily, I have two siblings to go to for advise and to share the responsibility. But, I realized this weekend, I need to do more. There are little things I can do that will not require very much effort on my part, but can make a big difference to my parents. My mother can no longer cook like she used to, due to memory issues. 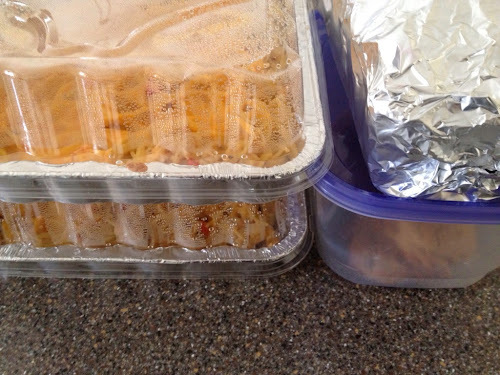 The burden of making meals falls too much on my father, so one thing I can do, is begin to stock their freezer with some home cooked meals and some baked goods. 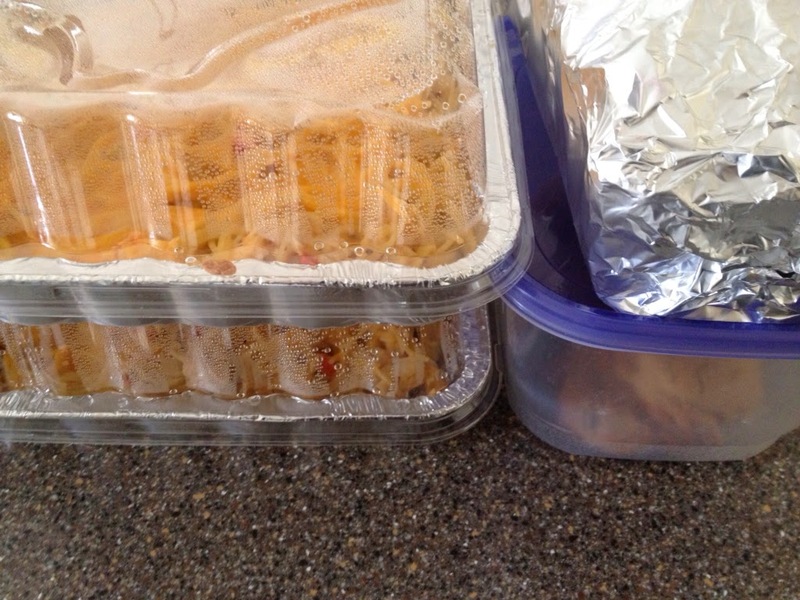 I prepared a few dinners for them, including one of our favorites (Chicken Spaghetti) that freezes well. Another thing my sister and I can do is find a way to gracefully offer to sporadically clean their home. They have refused a cleaning service, but it's just not something they are able to keep up with. A simple thing to accomplish, but a big difference to them. Finally, there is the gift of time. They live fairly close - only an hour's drive - and I can visit on a regular basis and offer what help I can. It's hard to find a balance when your parents are proud people, who won't ask for help, but if I am there, I can be in place when needed. Most empty nesters, including many of my friends are dealing with these issues; some even more challenging. We all want our parents to be able to keep their homes, their pride and their dignity. The decisions are hard, but are made with love and the best intentions. I was given the chance to receive a sample of my choice from eShakti and chose this lovely black and white print top, which I thought would be perfect for Easter. 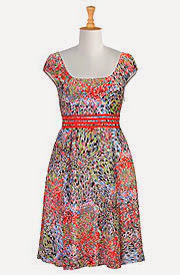 It will look great with a pair of white pants, a pretty necklace of black beads and a cute pair of black wedge sandals. If the weather is still chilly a black or brightly colored cardigan could complete the look. 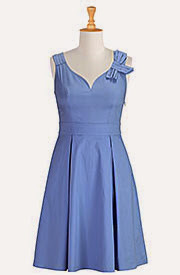 When making my choice, I also fell in love with several of the dresses in their spring line. 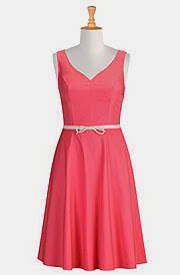 Our Easter weather will still be a little on the chilly side, but any of these pretty dresses would work well for the summer bridal showers and weddings on my calendar. 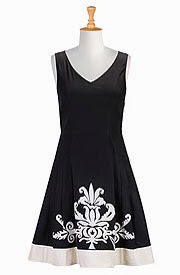 I love the detail on each one of these dresses with the bows, ribbons and other embellishments adding just the right touch. 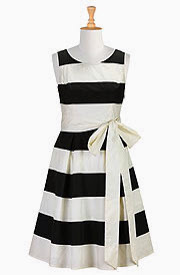 The style is classic and even a little vintage. 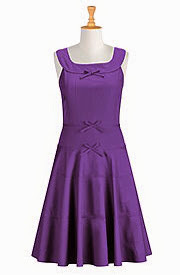 Which dress would you choose? 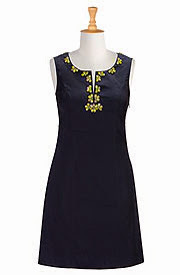 eShakti is offering my readers a 10% discount using the coupon code limes. 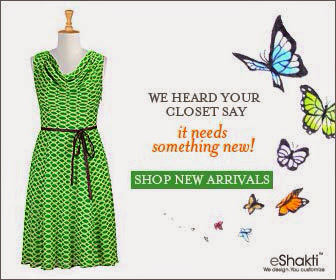 This code is valid anytime between 4/8/2014 and 5/8/2014.